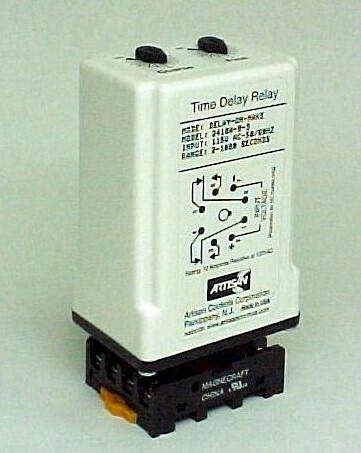 The 2410 is a delay-on-make timer controlling a DPDT set of relay contacts. The 2410 is available in a range of both AC and DC models. When operating voltage is applied the timing period begins. At the end of the timing period the output contacts transfer and remain transferred for a long as the operating voltage is applied. To recycle the timer the operating voltage must be removed and re-applied. Adjustable Timing Ranges 0.1 - 30.0 seconds, 2 - 1000 seconds, 30 - 8000 seconds. Purchase Tolerance Low time 0%, -50%, High time -0%, 30%. Ex: Timing range -3, (2 - 1000 seconds), can range from 1 to 1300 seconds, with 2 - 1000 seconds as a guaranteed minimum range. Operating Voltage 12, 24V DC or 24, 115V AC. Recycle Time Operating voltage must be removed for a minimum of 100 milliseconds to assure that the timing circuits are reset. Output Relay DPDT contacts - 12A at 125V AC UL E88991 & CSA LR90143, 10A 125V AC TUV R9452021. Dielectric Strength 1,200V rms between open contact sets, 1,500V rms between contacts and operating voltage terminals. Transient Protection Protected by silicon transient suppressors responding to transients within 1x10-12 seconds to a peak pulse power dissipation of 1500 watts.